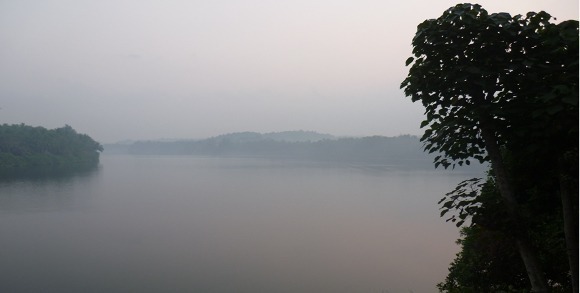 In this article, John captures the end of his travels, where he is enchanted by the beaches and backwaters of Kerala. 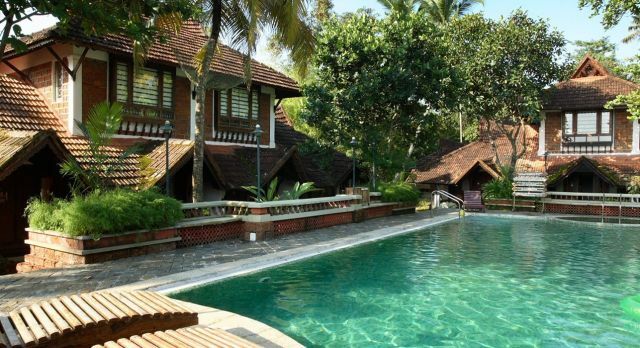 It was a one-and-a-half hour drive to Alleppey from Cochin; how on earth did our driver, Krishna, know where to go? Travelling down a narrow country lane, with tall vegetation on either side, I was certain he would falter. Yet how wrong can one Englishman be? Right in front of us was the Punnamada Backwater Resort! A gorgeous open plan reception, staffed with efficient and well-turned out staff waiting for us with a thirst-quenching drink as they processed our passports and booking. When introductions to the crew were made, we were escorted to our fantastic houseboat on the water’s edge. The crew greeted us in the traditional Keralan manner: a mark on our foreheads and a circle of incense in front of us. We felt like royalty, with two crew members and a personal chef to look after us. As we set sail down the gentle river (through the backwaters of Kerala), I could appreciate what people back home had been raving about. From the beauty of the waters; to the rich vegetation and rice crops on the shores; to the complete calmness, peace and serenity; to the cleanliness of the boat; the smart crew; superb dinner, gourmet style breakfast and drinks served as and when required; to the comfort of our cabin; the privacy the crew afforded us and especially the wildlife and the various species of birds we experienced, it all added up to a fantastic relaxing time. We moored at a very quiet stretch of water for the night and witnessed the mist rolling in and the morning sun burning it away. 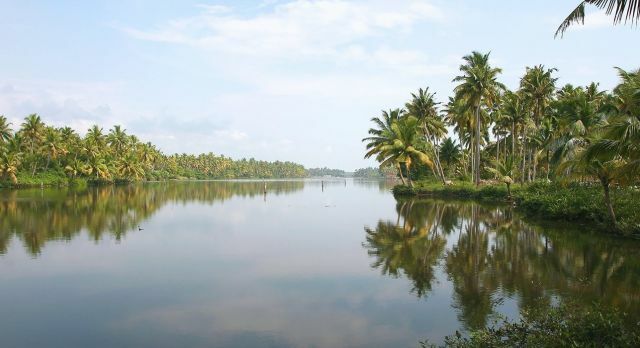 Alleppey has to be one of the most peaceful places on earth to live. A short drive was all we had to make for our penultimate place to stay. We said a sad farewell to Krishna: more than a driver, and much more than a man doing a job of work. Our final hotel, A Beach Symphony, was made in paradise. There were only four bungalows on site and we were given the honeymoon suite. And to be perfectly honest, if we were young and only just married, we would not have gone outside our home and certainly not further than the complex. The dining table was on the front verandah, with a really soft lounger. But through the patio doors was the piece de resistance. Our own exclusive and completely private swimming pool! Albeit small, but with high fences all around, we were shut off from the rest of the world. The waiters took our orders for meals which were superbly cooked and served. We could hear the Indian Ocean lapping at the golden sands which stretched to the horizon in both directions. Janet enjoyed a stroll twice a day, walking in the warm surf and enjoying the sun. Alleppey was an extremely busy and congested town but with a wide selection of stores and tea shops and well worth the visit we paid. On one walk, we came upon a wedding. The bride and groom were having some photographs taken and insisted we joined them in some shots. We were handed a cup of tea and invited into the reception. We declined the very kind offer. After all, with all the bright colorful saris on display, the last thing they wanted was two scruffy foreigners spoiling their special day. 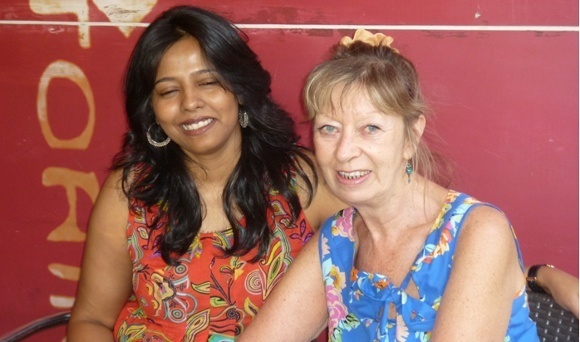 It was so typical of the friendliness we had encountered in both our stays in India. We love it. Chatting and laughing with them, what a delight and honor for us to have experienced this. On the final morning, I sat on the sands, just gazing out to sea, watching the fisherman bringing their catches ashore. And there they were! Swimming about a hundred meters offshore were a pod of dolphins. The date was the 24th January. My birthday. And what a lovely present it made. Seeing dolphins in their natural habitat. We had wanted to crash out on the beach for the final four days and A Beach Symphony was definitely made in heaven. Alas it was time to leave. The taxi arrived to take us to Cochin airport. En route, villagers were preparing an elephant for a religious ceremony. Jibec , the driver, obtained some food from the shop next door for us to feed him. This was the first time Janet had ever done this so she was a trifle scared but soon enjoyed being in the company of one of her favorite animals, feeding and touching him. The mahout asked him to lift his trunk in a gesture wishing us luck and happiness. What an amazing experience. No amount of money could have bought me better birthday presents. Dolphins swimming past me and then being in the presence of one of the biggest and most fascinating animals on this planet. The best presents I have ever had. On reaching the main road, Jibec was looking around anxiously and we soon found out why. He parked on the roadside, made his excuses and was back within a few minutes. He handed me this rolled up piece of raffia and just said “Happy birthday, Sir”. Unrolling it, I saw a fantastic painting of an elephant. I was deeply touched by the generosity of a man we had met only a half hour prior and whom we will probably never see again. It typifies what we have found throughout our stays in India: that the populace can never seem to do enough for you. Sadly it was time to leave and say goodbye to a person I have come to know and respect over the last two years; our tour coordinator, Prathima. A person with whom I hope to meet up again, and again, and again. A wonderful person doing a fantastic job in bringing her country to the world through travel. She has got to be one of the most dedicated persons I have ever met, being so enthusiastic, patriotic and passionate about her country. She is a real credit to Enchanting Travels and to India itself. 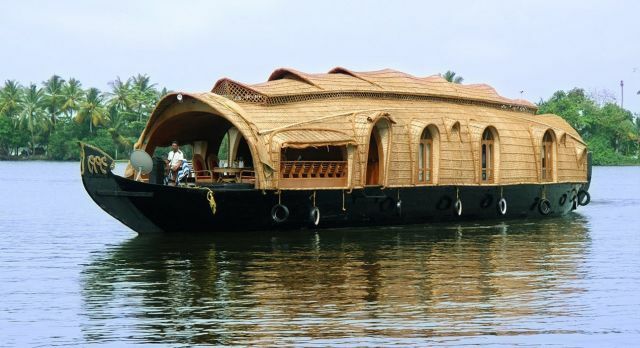 Discover the beaches and backwaters of Kerala for yourself with Enchanting Travels.